This item is sold by West Sussex Mediation Service. 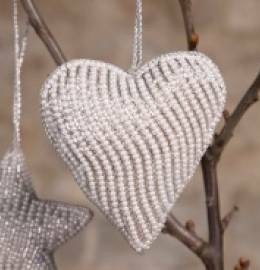 Lovely Hand crafted silver heart with small pearl beads thereon - Christmas Decoration or even Valentines! 85mm tall. "To prevent and resolve disputes between neighbours, within families and communities by providing advice, guidance and mediation services to people and organisations in West Sussex." Buying this item, you are supporting West Sussex Mediation Service. This item will be sent from Horsham, Horsham, West Sussex RH13 5SB, UK.